First off, for the unfamiliar, a quick overview of what a “trunk gun” is: Trunk guns are always long guns and almost always rifles. Even if you kept a Desert Eagle .50 AE in your trunk, all the time, it would never graduate to trunk gun. It would forever remain just a gun in your trunk. While a single-shot bolt-action squirrel rifle loaded with .22 LR ammo riding shotgun (ironically) in your passenger seat would qualify as a trunk gun. Trunk guns can be either rifles or shotguns but, as mentioned, are usually carbines. They don’t have to be in the trunk, though they often are. According to the trunk gun purists, they are also not long guns that share time between your vehicle and anywhere else; they are strictly car-based. So if it’s a long gun that’s exclusively dedicated to your vehicle as an offensive or defensive option, it’s a trunk gun. Now that it’s defined: Is it worth it? There are some pros and cons to consider. There’s a good chance that if you’re someone who is considering having or who does have a trunk gun, you are open- or concealed-carrying a handgun. If not, the trunk gun is your only firearm-based line of defense you’ll have access to if you find yourself in a dangerous situation within or close to your vehicle. Having something rather than nothing in that situation certainly qualifies as a tick in the “pros” column. If you do carry on your person and find yourself in a situation where your sidearm is insufficient, having access to a Mossberg pump and 12 gauge ammo or an AR-15 and several mags of .300 AAC Blackout will be an aid. You’re most certainly going to be in a much better position to mount an effective defense and offense. Basically, it’s an insurance policy against being left unprepared or under prepared should you ever be in a situation where you do need to use it. To be fair, the critics and skeptics of the civilian trunk gun concept have some fair points. Perhaps the most valid is the risk of theft. There are hundreds of thousands of vehicles stolen in the U.S. every year. And that doesn’t include vehicles that are stolen from. That’s a lot of vehicle-related theft. Should that happen to your trunk gun-equipped vehicle, someone who is clearly of dubious moral character now owns your AR-15 or tactical shotgun. It’s not a concern to be shrugged off. There are practical and safety concerns, as well. The conditions in which a trunk gun would prove necessary are pretty specific. You encounter a situation that requires the use of possibly deadly firearm-based force that happens while you are in your vehicle or in its immediate vicinity. The situation also then calls for greater firepower than a sidearm provides (assuming you carry), in which case you can (hopefully) reach your trunk gun in time for it to be effective. And there’s the risk that accompanies carrying any weapon into something like an active-shooter situation, though increased by the conspicuousness of long gun: law enforcement or another civilian carrier may mistake you for the bad guy and open fire. There are reasonable arguments on either side and risks accompanying deciding for or against a trunk gun. Which of those arguments and risks are more compelling, however, only you can decide. Ammunition Depot is widely regarded as the best online source for ammunition, guns, gear, and any shooting accessory you’d need. Whether you’re looking for a gun or the best ammo to feed it, Ammunition Depot has your back. 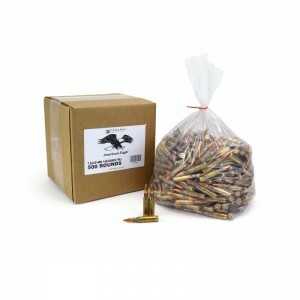 They offer everything from a box of 6.5 Creedmoor to 1,000 rounds of top-quality .22 LR ammo, as well as .300 AAC Blackout, .223 ammo for sale, and just about everything else you’re looking for. The folks at Ammunition Depot are proud to support the Constitution and shooting rights. They also donate to charities for law enforcement and the troops, and promote vet-forward job opportunities in their home state of Florida.